New shower glass sparkles and shines. But if you don't squeegee after showers or use a good glass cleaner regularly, layers of dirt and scum start to form. 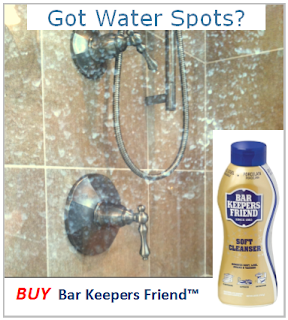 QUESTION: So how do you prevent soap, body oils and hard-water minerals from leaving water spots on shower glass? ANSWER: The trick is to swipe away water with a squeegee before it dries on the glass and use a good glass cleaner (with NO ammonia) on a regular basis. What Can be Done About Water Spots? If glass cleaner doesn't break down the layers of YUK, you need to step up to a water spot remover. Follow manufacturers instructions then thoroughly rinse, squeegee and wipe the glass dry with a micro fiber cloth. PLAN B: Some people prefer using a homemade 50-50 mix of white vinegar and water with a dash of liquid dish soap. Apply with a spray bottle, scrub with a dryer sheet then wipe dry with a cotton T-shirt. Note: water spot removers are mildly abrasive so test a small area (like a bottom corner) before smearing it all over the glass. Be especially careful if your glass has a water repellent coating applied and consult the manufacturer for acceptable products to use. 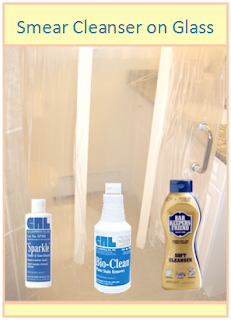 Here are three popular water spot removers we tested to dissolve the cloudy layers of dirt and soap buildup on a shower door. 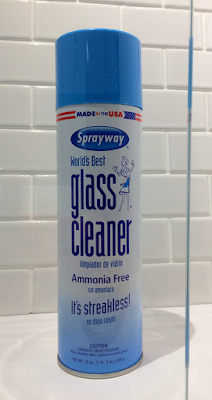 Each section of glass had a generous amount of cleanser smeared and rubbed onto it. 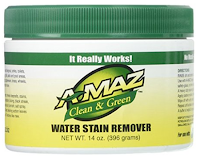 After applying the water spot remover, let it set for a minute or so then buff and remove the cleanser using a microfiber cloth or cotton T-shirt. It should clean up easy like a car wax. Repeat the process if you notice any scales left behind - and don't be afraid to try another product if you're not getting clean results. 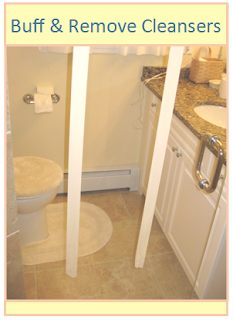 TIP: Use a soft tooth brush for inside corners and hard to get nooks and cranny's. 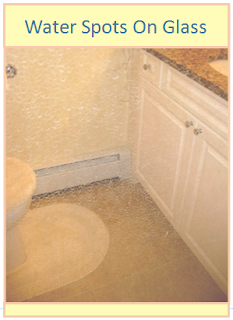 THE BAD NEWS: If you have tried water spot removers and still have cloudy shower glass - the minerals and chemicals have probably etched the glass permanently and will never look clean again. After you buff out the dried water spot remover, use a good liquid or foam spray glass cleaner to remove and dusty streaks left behind. Be sure to wipe glass dry and avoid making more streaks by using a good paper towel (like Bounty) or a micro fiber cloth / cotton tee shirt. Each water spot remover we tested dissolved the light stains effectively. Bio-Clean smelled really nice, BarKeepers Friend worked fast and the Sparkle came in a small easy-to-hold bottle. Glass cleaners all worked pretty much the same. 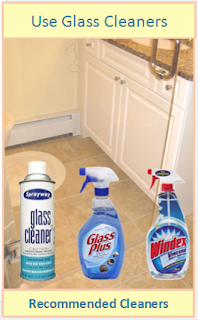 Glass Plus had a nice smell, we also liked the Windex / Vinegar mix, but our favorite glass cleaner is the Sprayway aerosol because of the foaming action and sweet smell. So be sure to buy a good squeegee and use a quality glass cleaner on a regular basis to avoid those dreaded water spots.